South Carolina is home to the US Department of Energy's (DoE's) Savannah River Site, which provides storage for military weapons material. Some of this - classified as 'surplus' plutonium - has long been earmarked for destruction as fuel in civilian nuclear power reactors. The chosen method for this was manufacture into mixed oxide fuel assemblies via the dedicated plant under construction at the site - but the funding to build this plant was reduced to zero in the DoE's budget request for FY2015. "Through the unilateral indefinite suspension... without any plutonium disposition alternative - without Congressional authorization or approval - and without any legal authority, the federal government has failed to not only honor its commitment to South Carolina but has breached its obligation to responsibly address the disposal of surplus plutonium." The origin of the project was a bilateral deal made with Russia to remove equal amounts of weapons-usable material from both countries' stockpiles. The two nations agreed to dispose of 34 tonnes of plutonium. America opted for MOX, while Russia decided to use its plutonium as fuel for fast reactors and continues with this. 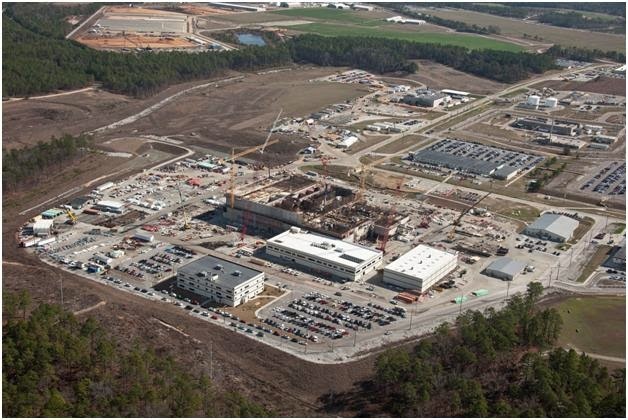 After around $4 billion appropriated from US budgets over the years, the US MOX plant stands at 60% complete, according to South Carolina's legal complaint. The state said the construction had been employing 1800 people, with another 4500 jobs supported in the local Aiken county. Furthermore, South Carolina is unhappy about remaining the custodian of the unwanted plutonium which now has no disposal strategy. The DoE's stated reason for cutting funding for the MOX plant is that "it has become apparent that [the plant] will be significantly more expensive than anticipated, and therefore, the budget request places the MOX facility in cold stand-by while the department evaluates plutonium disposition options." A report from the General Accounting Office last month said the cost of the MOX plant had risen from an original approved estimate of $4.8 billion to some $7.7 billion as of 2012. At the same time the scheduled start of operation had moved back three years to late 2019. Wilson called the decision to 'close-up' the MOX plant and stop work on it a "violation of the constitution." The state's lawsuit, filed against the DoE, contests its use of Congressionally authorized funds for close-out rather than construction.